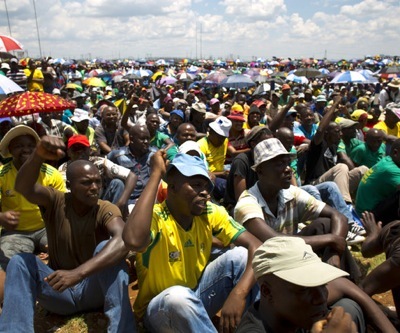 The South Africa's Association of Mineworkers and Construction Union (AMCU) lowered its wage demands for the first time Tuesday, signalling the almost six-week strike at the world's top three platinum producers may be ending soon. Reuters reports the AMCU representatives said they still want monthly entry wages to start at US$1,200, more than double current levels. But now they are giving companies a three years window to do so, compared to the original demand for the rise to be immediate. Yesterday, the group has announced its members would march in Pretoria this Thursday. While the labour action has so far failed to ruffle traders, Anglo American Platinum (Amplats —LON:AAL), Impala Platinum (Implats) and Lonmin (LON:LMI) continue to hold talks with union leaders under the auspices of a government mediator, hoping of a prompt solution. The strike has affected more than 40% of the global production of the metal, used widely in the auto industry. So far the companies say they have collectively lost more than US$615 million (6.6 billion rand) in revenue, according to the Chamber of Mines' online updates.